One indicator of the types of screenplays that are nominated for awards is within the Best Picture category. The vast majority of films that have won the top prize have been adapted from other sources (novels, short stories, remakes of other films, stage plays or musicals, TV shows, various writings, etc. ), while many fewer have been original screenplays: See also: 101 Greatest Film Screenplays of All-Time and 101 Funniest Screenplays of All-Time. 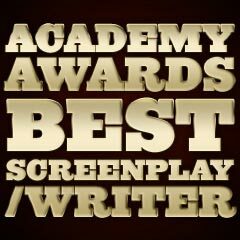 There have been many writers who have unofficially worked on various nominated (and winning) screenplays who are not included or credited for the screenplay. [Uncredited but talented screenwriters include neophytes, called screenplay polishers, who make minor rewrites to improve the dialogue or scene directions.] The Academy Awards include only those who are officially nominated. See an entire detailed listing of Academy Award Script/Screenplay Winners from 1927/28 to the Present on this site. in 1940, the Academy started a new category - Best Original Screenplay, in addition to the other two categories: Best Original Story and Best Screenplay (adaptation). Best Original Story was intended to give credit to the authors of performance works (not novels) that films were based on. Therefore, oftentimes, the source and its adaptation would earn nominations - and Oscars. Woody Allen (16) and Billy Wilder (12) have been nominated the most for any screenwriting category. Five individuals have been awarded with three (3) screenwriting Oscars: Billy Wilder, Charles Brackett, Francis Ford Coppola, Woody Allen, and Paddy Chayefsky. Note: All of Allen's nominations were under the Best Original Screenplay category. Note: Wilder had 7 Adapted Screenplay nominations, 4 Original Screenplay nominations, and one Best Original Story nomination. Together, Wilder and Charles Brackett are responsible for a total of 14 screenplay nominations. They co-share 5 screenplay nominations (from 1939-1950) and two wins: The Lost Weekend (1945) and Sunset Boulevard (1950). Only two of Brackett's nominated screenplays, To Each His Own (1946) and Titanic (1953) did not involve his frequent scriptwriting collaborator, Billy Wilder. Note: Federico Fellini has the record for most screenplay nominations for a foreign language film. Four of his films won Best Foreign Language Film Oscars: La Strada (1954) in 1956, Nights of Cabiria (1957) in 1957, 8½ (1963) in 1963, and Amarcord (1973) in 1974. Note: Billy Wilder, Francis Ford Coppola, Charles Brackett, Woody Allen and Paddy Chayefsky share the Academy Award record for Oscar writing wins (3) in all categories. Note: McCarey was also nominated for My Son John (1952) for Best Motion Picture Story - equivalent to Best Original Screenplay.